Dadami may be Korean food, but it’s unlikely you’ve ever had Korean like this. 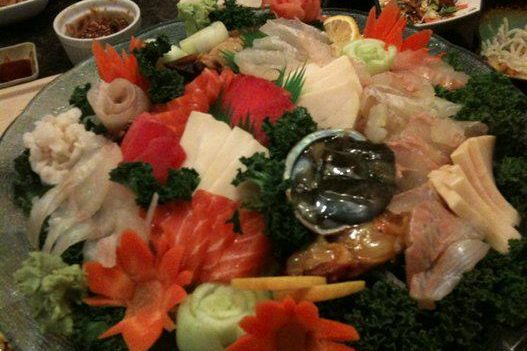 This family-run restaurant specializes in hwe, the Korean version of Japanese sashimi. Your fish—typically red snapper, though the restaurant occasionally has other specimens in its tanks—is killed when you order it, then fileted and served alongside other raw delicacies such as sea squirt and sea anemone. The rest of your fish is used to make a delicious, spicy stew filled with vegetables—and these are only a few of the courses you’ll get when you sit down at Dadami with a group (the best way to go). Just tell your waitress how much money you want to spend, and the kitchen takes care of the rest, sending out a parade of exquisitely presented dishes until you cry “uncle.” Toast your friends the Korean way, and order a few bottles of soju for the group.